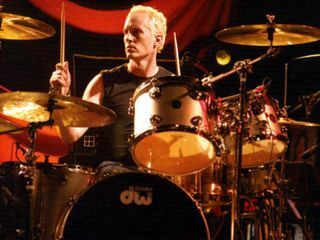 Josh Freese has drummed for Nine Inch Nails, Guns N' Roses, Devo, Sting, and if you had $75,000 to blow a couple of years ago, chances are he joined your band for a month. But one thing the in-demand sticksman isn't doing is playing is with A Perfect Circle this summer, as was originally planned. Instead, he's honoring a prior commitment and will be pounding the skins for Weezer. "I'm sad to report that I will be sitting out the A Perfect Circle tour this summer. Maybe the hardest decision I've ever had to make professionally and it hasn't been easy on me. I've been looking forward to APC reforming for years now and the timing just couldn't have been worse. I'd already committed the time to Weezer and I am a man of my word. As much as I hate to have to miss the APC tour there wasn't a whole lot I could do about it. "I get asked all the time how I manage to 'do it all.' Well, usually I do 'do it all' and it's a combination of working really hard and driving myself and my family a bit crazy. But SOMETiMES it doesn't work out and this time I'm forfeiting something very close to my heart and something that I take a great deal of pride in. I've never apologized to fans of a band for not being able to be there for something so I'll take this opportunity to do it here. I'm sorry that I'm not going to be there with APC this summer. I've missed other tours with other bands over the years but this one has been the toughest pill to swallow. "The APC guys have been unbelievable [sic] cool, understanding and supportive about my situation. Yes, they're bummed but no, they don't hold it against me and all is well with us. They are true friends and I'm very much remaining the drummer in the band and look forward to being involved again on whatever we venture off to do next. Hope to see you guys out at a show sometime either later this year or in 2012......ya never know."